I’ve always been one for variety. My reading library spans the realms of everything from fantasy to family dramas and children’s titles. There’s even some non-fiction in my arsenal; I’m a sucker for a good biography, especially when they’re about serial killers or mob bosses. Just sayin’. When it comes to my own writing, this is still the case: variety is in my blood. Later this year I’ll be releasing my first stab at the horror genre (check out And Then Came A Spider this summer!). My Kindle short story MACHINES is a Hitchcockian thriller featuring a gay couple and some suspicious tea. The first book in my YA fantasy series, Horns & Halos: Against The Giant, follows a group of teenagers who are segregated according to their horns and halos. They live in a world of hate and punishment, but now they’re fighting against it in the name of friendship, truth, and the freedom to date whoever they want. 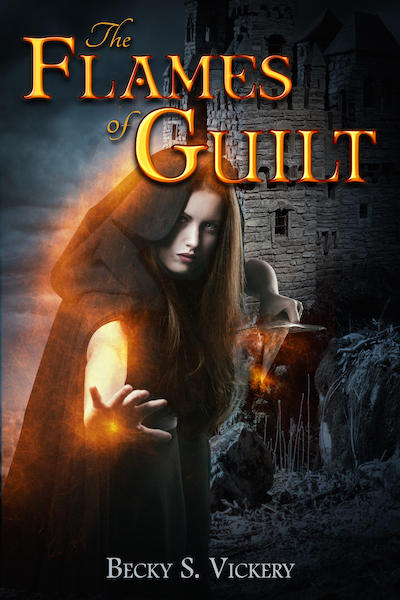 And my first novel, The Flames of Guilt, is an adult fantasy with a fairy tale twist. Kings, queens, a curse, a seer who goes blind, a slobbering monster dog and a gang of bandits all included. Not to mention, it’s a love story with just a drizzle of sappiness to make you go, “awww”. But when it comes to picking a favorite genre to dabble in, I have to say that I LOVE writing fantasy the most. I will always have stray stories pop up in my collective works – a little horror, a murder mystery, some thriller and science fiction and maybe even a contemporary romance one day. But my heart will always fall back to fantasy. Fantasy is an awesome place for me to live as a writer because anything can happen. Whatever I dream, whatever insanity festers in my imagination, I can incorporate it. With fantasy, I’m not just placing characters into a situation, I’m also creating the world and all its rules and inhabitants. Fantasy is the place of monsters, trolls, giants, one-legged snakes, wizards, and sea creatures named Earl. It’s where elephants fly and dogs talk. It’s the place of no boundaries or rules, other than the ones you create. Of course with all this creative freedom, there’s also responsibility involved. Since I create the fantasy world where my characters live, I also have to make sure it all makes sense within its own system; this is called world building. But that’s a different topic for another blog. Fantasy is great because it gives me the chance to take crazy characters and completely fictional settings and issues and inject the human condition into them. Chances are my readers can’t relate to being attacked by giant, man-eating plants (check out the Horns & Halos free short story Boy Eating Plants here!) but I bet they can relate to being accused, found guilty and sentenced to punishment, which is exactly the case when Allyster Williams finds himself standing in front of the queen of the massive, carnivore plants who can not only eat you, but they’ll tell you why before they do it. No matter which genre you choose to write in, it’s important to build a bridge between your characters and your readers. In fantasy, this can be a little more challenging, since situations with dragons and tooth fairies and a leopard who writes poetry will never happen in real life. But I’ve always been one for a challenge, and since my brain naturally thrives in the world of poetry writing leopards, the fantasy genre is a safe, happy place. With chocolates on the pillow. Check out the trailer for Horns & Halos: Against The Giant. Get your ebook or paperback copy here! Check out the trailer for The Flames of Guilt. Get your ebook or paperback copy here! And if thrillers are your cup of tea, don’t miss MACHINES.